I haven't long since bought a BMW f700gs. I will mainly be using it on roads but fancy doing as much of the UK TET as possible, in bits. I know it is perhaps the most fancied bike out there for this sort of thing but I'm thinking that as long as I take it steady and am prepared to miss bits out, I should be able to do a fair bit. I was hoping for some input from people that have come across similar bikes on the trail. How were they doing? I am intending to fit some bits and bats that might make it more trailish. I'd even be happy to upgrade the suspension if necessary and put some knobblies on it. Your main trouble will be the weight, there is not really a lot you can do about that, besides travelling light. Knobbies would definitely help in muddy situations, though most here seem to ride normal 50/50 tires since they provide the best of both worlds. Besides that, its 20% gear and 80% rider, so don't worry and be sure to get some practice time. Having said that, I have one as well and really enjoy it. It fits my mission perfectly and at the time of purchase I couldn't really justify the added cost of going for the F800. - fit some knobblies, you will need it. - don't waste money on beefing up the suspension. It is what it is. They were not designed for that and personally I would rather sell mine and go for the F800 . It will probably work out the same in cost. - Their biggest Achilles heel in my opinion are the cast wheels. As long as you don't hit a pothole or such at speed you'll be fine. Hope this helps. Unfashionable? No way. From all the videos of the TET in all the countries I've seen so far, I'd not hesitate to take the F7 there. As long as you take it easy, I think it's doable. !967 Yamaha Trailmaster 100. 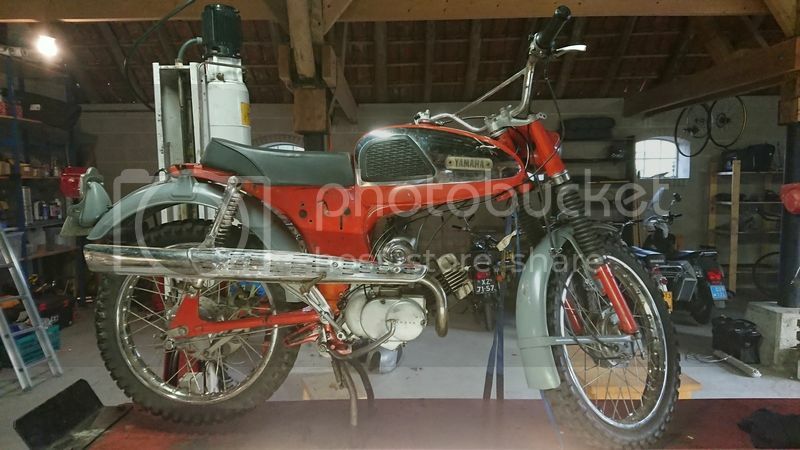 Two stroke with electric start and two different rear sprockets to have 4 low and 4 high gears for when the going gets tough !